1. Grease 9 X 13 - inch glass or stoneware baking dish and set aside. 2. In mixer bowl with whisk attachment, or in a large bowl with a hand mixer, whip eggs, concentrated apple juice, milk, canola oil and maple syrup together until foamy. 3. Add cinnamon, baking powder and oatmeal, and stir until mixed. Add apples, walnuts, and any other add-ins. Stir in and mix well. 5. Mix the 1/2 cup brown sugar and 1 teaspoon cinnamon together. 6. If making the Baked Oatmeal with quick oats, pour into prepared pan, sprinkle the brown sugar over the oatmeal, and let sit for 15 minutes so the oats can soak up some of the liquid before baking. Bake for 45-50 minutes. Oatmeal will puff up and rise a bit while baking, but will settle while cooling. 7. 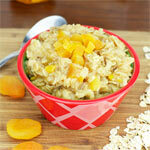 If using old-fashioned rolled oats, cover with plastic wrap and refrigerate overnight. Remove from fridge, uncover, and let sit while the oven is preheating to 350 degrees F. Bake for 45-60 minutes, or until puffed and slightly browned around the edges. Bake time may take longer straight out of the refrigerator. 8. Careful! Let cool for 10-15 minutes before serving. 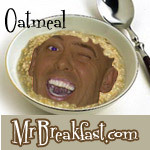 Baked Oatmeal can be very hot! 9. Serves 6-10, depending on serving size. 10. Serving suggestions: Top with yogurt and fresh fruit; Top with whipped cream for dessert; Add milk and sprinkle with brown sugar; Drizzle pure maple syrup over the top. Great with cinnamon applesauce on the side. 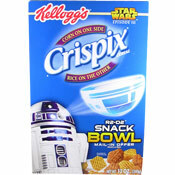 Optional add-ins include raisins-craisins, dried apricots, etc. I make a batch and this is my breakfast for the week. It can be a very low fat and low cholesterol meal. It also freezes very well. 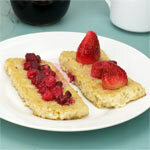 Mr Breakfast would like to thank emichael for this recipe. 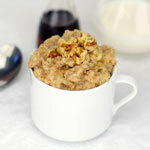 What do you think of Best Amish Baked Oatmeal? Awesome recipe. I used Rice Dream, added cranberries, and cooked it a little longer to make it a little crispier on the top. My very picky wife loved it too. This is the most wonderful, versatile recipe I have ever used!! This lends itself to so many different variations!! When I want on-the-go breakfast bars, I omit the milk, and still soak it over night. I also add in 1 cup of mashed banana when I omit the milk. We just tried this with frozen blueberries & craisins and I can say is super wow!!! This is definitely a keeper for our family! !